There is a great battle that rages inside of all of us. One side is the soaring eagle. Everything the eagle stands for is good and true and beautiful, and it soars above the clouds. Even though it dips down into the valleys, it lays its eggs on the mountaintops. The other side is the howling wolf. And that raging, howling wolf represents the worst that’s in us. He eats upon my downfalls and justifies himself by his presence in the pack. Who wins this great battle? The one we feed. Friday morning reminded me of this battle. Actually the massive panic started Thursday evening. Schools were closing, roads would be shutting down and everyone South of the Mason Dixon was bearing down for Round 2 of the 24-hour Polar Vortex flu-bug. (You know when the temperature goes from 70 to 25 in less than a day? ) For weeks I had been planning a trip (that had been paid for) to Austin with four girlfriends to spend the weekend recharging. I woke up Friday, snuggled with my daughter, dressed her and got her off to her backup care facility. Her school had closed, too. I made my coffee, watched some news, and stayed comfortable in my PJs for a little bit. I worked, responded to some emails and in between fielded text and Facebook messages from my girlfriends and husband about the weather and the uncertainty we had in whether the trip would go on as planned. You know that feeling, right? Should I stay? Should I go? Why me? Why now? Again, I just kept thinking “feed the eagle”. It was a touch and go morning. I had to get my tires rotated, gas up, run a lunch over to my daughter, and get packed. In between all of the madness and last-minute rush, I got a call from my doctor about my recent female checkup. The feedback wasn’t pleasant and unexpected. “You have abnormalities and some cells we want to examine.” Since winning my cervical cancer battle in 2001, I’ve had abnormalities, but we’ve usually just retested. Today (this morning) I will have a biopsy to see if we need to do anything further. And while this news had me a little unnerved…. I just kept thinking “feed the eagle”. So on Friday at 1:30, an hour later than we planned to leave, all five women made our way out-of-town to Austin to an amazing conference called MomCom. We spent 1.5 days connecting with other women about life, work, and motherhood. We heard from amazing speakers … award-winning author, Glennon Doyle Melton and photographer/Livestrong Co-Founder Elizabeth Kreutz. We met women who’ve braved so many crazy things in their lives…eating disorders, addiction, divorce, infidelity, job burn-out. We learned about how to become guilt-free thanks to Marci Fair. We got real. We laughed and cried. We ate and shopped. It was a weekend full of warm memories and new friendships. Life throws us all curveballs. The weather changes overnight and can ruin plans. Things happen that are out of our control. And yes, the world can deal you an unfair hand. So, which part of the battle are you feeding? The soaring eagle or the howling wolf. What thoughts are you feeding, today? What a great summary of your experience and analogy! So glad I met you at MomCom! Feed the eagle! Great blog! I am so happy you made it to Momcom! Great story! What clear inspiration that what we focus our attention on drives our path, our journey, our results. Parenting offers little control, only reveals obstacles and many times shortcomings. Yet it is those times we practice what I have learned recently that the Navy SEALs teach, ‘forward thinking focus” that opens doors, releases talents, and makes dreams come alive. I’m just now struck with the question of how many times I lose focus by looking outside for an eagle to feed when I should be looking at the one who is inside, waiting to be released to soar where he is intended. Thanks for sharing your journey! Feeding the eagle, now. How uplifting this blog was for me today. 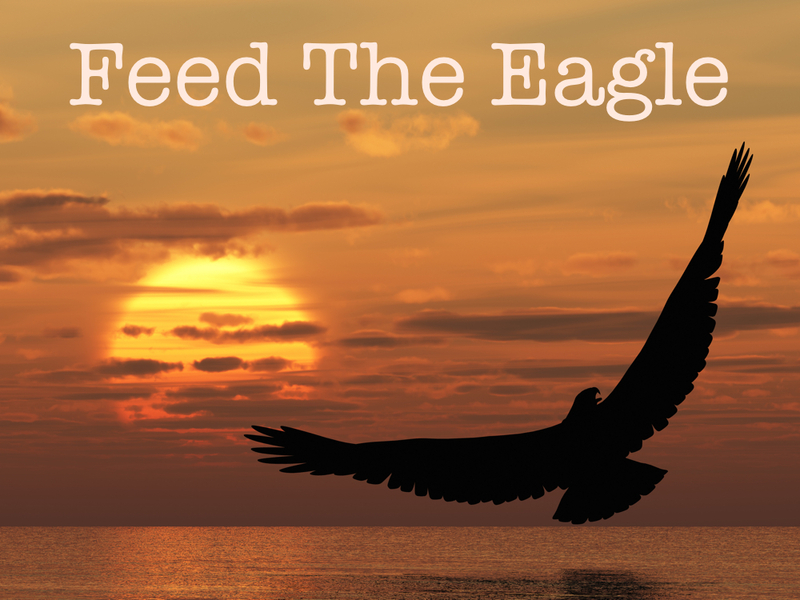 Being recently laud if from my job, I needed to hear what I should focus on most–feed the eagle. I know God has a plan in it all and I will stand strong to the end.